Good Day Followers and New Followers. 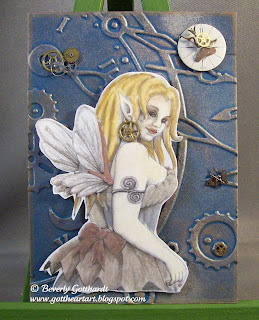 Today begins the fortnight for our Challenge #5 Anything Goes at ATCs & Cards With Attitude. Yes, you see a little change in our title. We're expanding to add cards to our challenges in hopes of attracting some added challenge buffs. Also, starting in February we will be adding themes to our challenges. We'll keep the Anything Goes, but add a slash theme, sometimes it's easier to create something if you have a theme to spark the little gray cells creativity. You will be able to do one or both if you feel really creative on any given fortnight. Our fearless leader, Abbie, has lined up wonderful companies to sponsor us through the rest of the year so there will be prizes with each challenge. Now come on you guys who doesn't love prizes? I'm trying to encourage you all to come over and play along, we've got a great design team and we encourage all talents and we love to see all the diverse favorite techniques you guys love to create with. I've named this fairy Sprocket, she's working the midnight shift in her workshop tinkering with some time pieces. She's a digi from Delicious Doodles , they are offering a choice of 4 digis for the prize this time around. I've embossed a Navy piece of card stock and hit the high points with Metallic Rub-ons. I printed the fairy to the appropriate size, colored her with metallic art pencils and a Clear Star Gel Pen on her wings for just a touch of sparkle, cut her out and popped her up on dimensionals. I happened to have a tiny gear that just fit on her earring, and I added the other tiny gear and watch pieces with clear drying glue. She would be perfect to enter in a Steampunk ATC swap. We look forward to seeing you over at ATCs and Cards With Attitude--you have until 2-2-12 to enter the challenge. She's wonderful...I like fairies who look competent, and she has such a self-assured air. The coloring is great and the earring is the perfect finishing touch!